To learn more about all of the benefits of becoming a Stealth Profits Trader subscriber, click here. This morning, markets opened down after an impressive run-up produced by Fed dovishness and mega-tech stock earnings reports. The last two days, the mega-techs have taken a pretty good beating, but their recent earnings have helped fuel optimism. The big tech stocks, notably the FANG stocks (acronym seen below) are STILL the place to be for intermediate to long-term investing. After all that they’ve done over the past few years, how (might you ask) are they still good investments? If we allow AMZN to round up that’s four out of four with 20% or more revenue growth. Just amazing. Today’s pullback will give us an opportunity to buy some stocks that were getting short-term overbought as of Tuesday. And I do believe that we have a strong expectation of continued move up over the next two weeks. 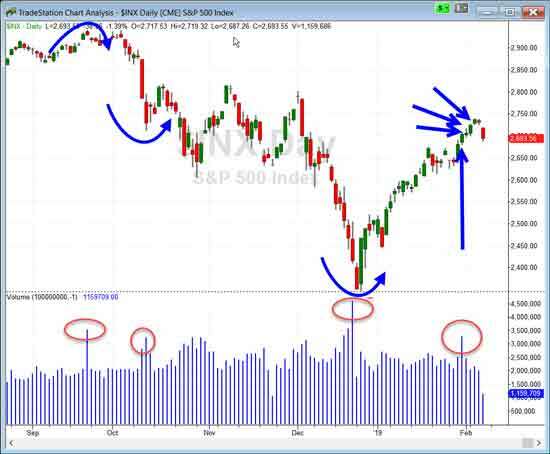 However, something unusual happened after last Thursday’s volume spike: we had the following three days continue in the direction of the big up volume day, with all three having higher highs, lows, and closes. This shows strong momentum. And this pattern has only happened 30 times dating back to 1995. 23 of those occurrences, or 77% saw the market close higher two weeks later, with the average gain being 3 times greater than the average loss. So the market remains under strong momentum, and a pullback like today just gives us a good buying opportunity. Let’s see if the selling slows into the morning – if so, I’ll be send out some new trades that take advantage of this temporary weakness.